Every year I try to make at least one free ornament tutorial for my awesome blog readers. This design has been in my sketchbook for months! I finally had a chance to make it this weekend. It’s a colorful rainbow with fluffy little clouds made with mini pompoms. A pompom maker (get my Llamallooma here! 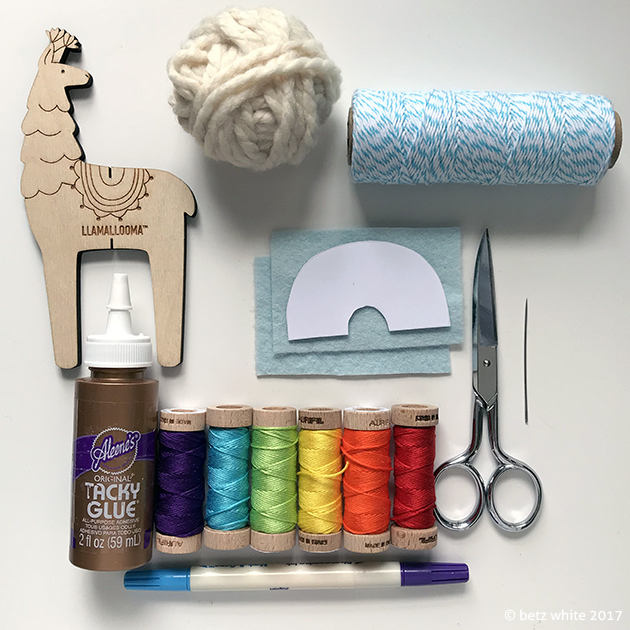 ), white yarn, a few scraps of light blue felt, scissors, glue, a disappearing ink pen, an embroidery needle and a rainbow assortment of embroidery floss! 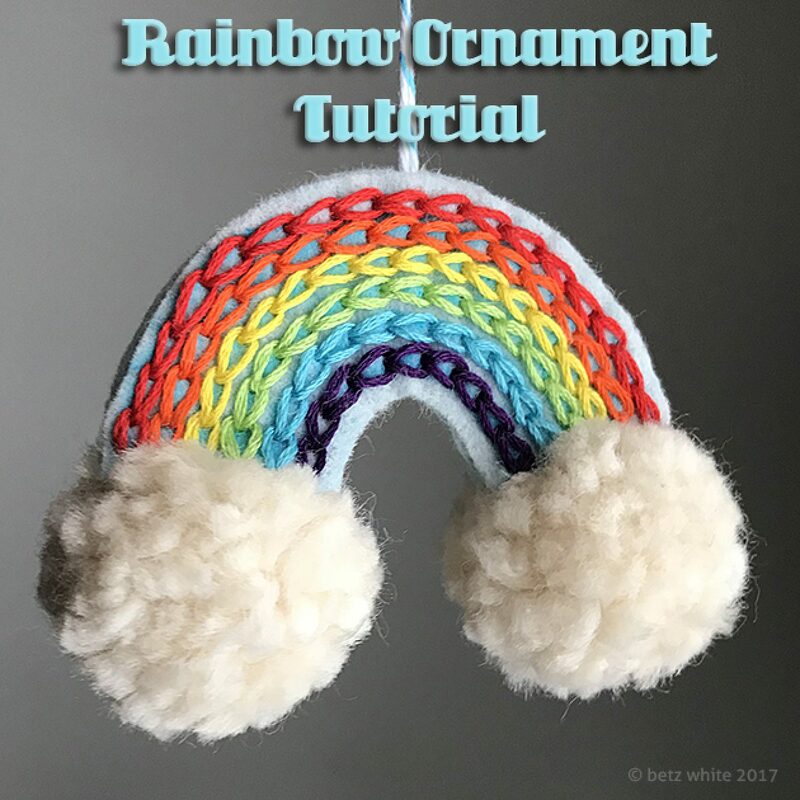 You’ll need to make a template for the felt rainbow. Mine measures about 3″ wide by 1 1/2″ tall. It’s basically a half circle with a little arch cut out of the center. You can trace a lid or just wing it like I did! 1) Start by making some mini pom-poms. 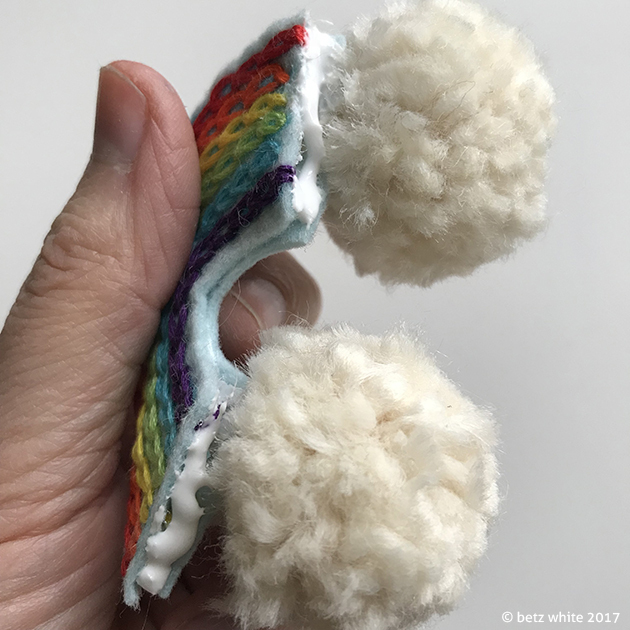 (Find my tutorial for mini pom-poms here.) Cut 2 arches out of felt using your template. 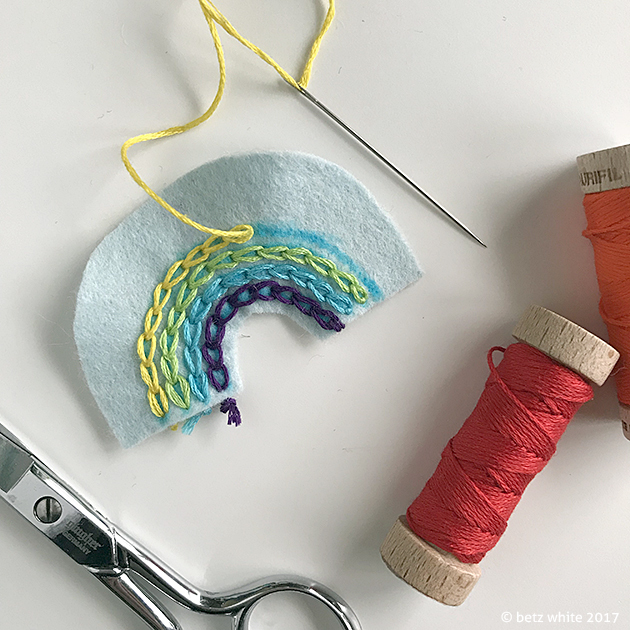 2) Next you’ll embroider the rainbow onto one arch using a chain stitch. I suggest using all 6 strands of floss . I began with purple about 1/8″ from the inside arch. Then mark a line for each subsequent color with a disappearing ink pen and stitch it. 3) When you’re finished stitching, press the felt with a warm iron then trim away the excess felt at the top curve, about 1/8″ from the last row of stitching. Lay this one on top of the second arch and trim the second one to match the stitched arch. 4) Next flip the piece over and apply glue on the back. Tie a piece of twine into a loop and press the end into the glue at the center top. 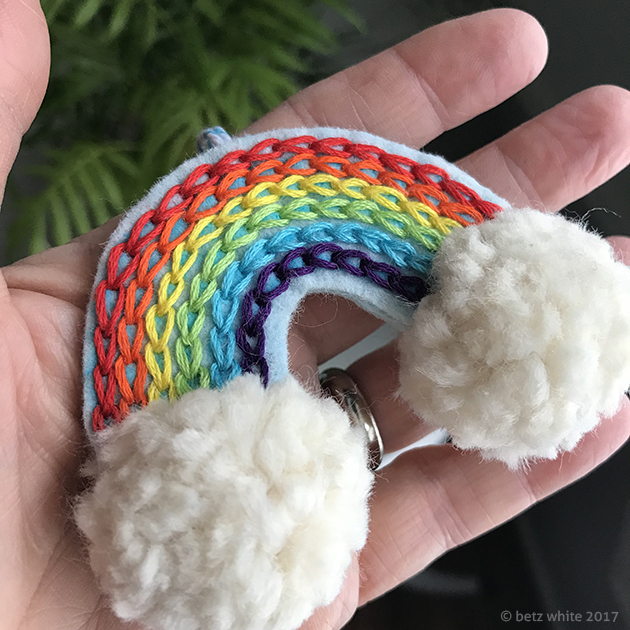 Place the mini pompoms at the base of the rainbow, laying the ties into the glue. Place the second arch on top, sandwiching the hanger and ties between the layers. 5) Lastly add a line of glue to the bottom edges of the arches and press the pompoms into the glue. You might need to use a few straight pins to secure them while the glue dries. And there you have it! Super cute, colorful and fluffy! 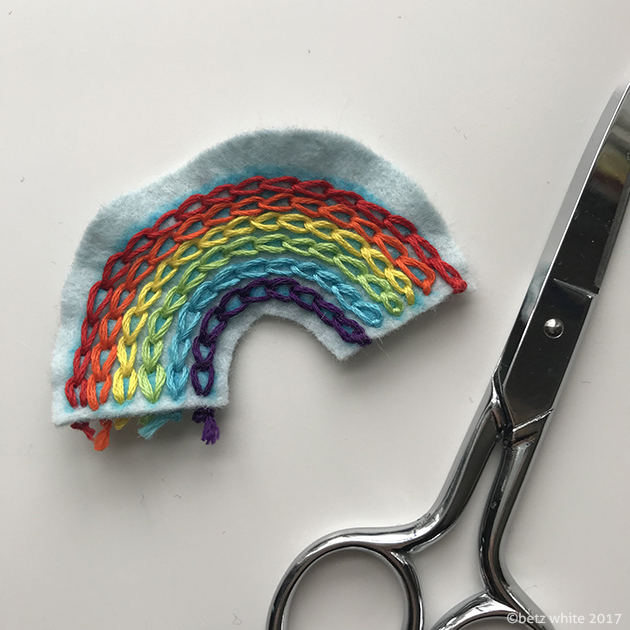 If you’d like, you can make your rainbow 2 sides and embroider the back piece of felt as well. Or personalize it by embroidering a name. I hope you enjoy making this! I can’t wait to put this one on my tree. Or I may hang it in my window year ’round! You’ve got some embroidery skills! Your stitches are so even. 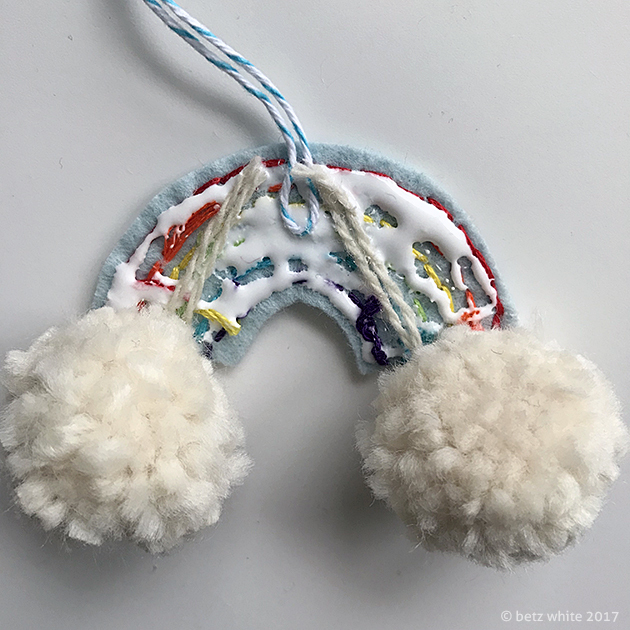 A rainbow with puffy pompoms makes a cute and happy ornament!